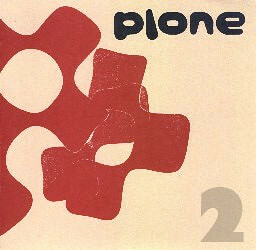 The perfect soundtrack for this hot summer afternoon is Plone's unreleased 2nd album which is currently echoing throughout the house as I go about my daily chores and get ready to head out to a party later this evening. I don't know much about this album other than it was finished sometime in 2001 just before the group split, and my guess is that it was let loose on the interwebs so as to be heard and appreciated. This collection of 16 perfectly laid-back electronic tracks are full of their cute and simple xylophonic melodies, analog portamento, plinky rhythms, twinkling synths and smooth organ vibrato, but a new style direction can be heard. Many of the songs do sound like they were written around the same time or shortly after their first album "For Beginner Piano ", but some of them contain the addition of live-sounding acoustic drums and an almost krautrock feel, such as the track "140" which extends into something of a lengthy, Neu-ish jam. A mid-century cocktail bbq feel still dominates with dreamy vibraphone, some vintage strings, uplifting chord progressions, and psychadelic sounds which would be a joy to play on vinyl. You can definitely hear some new ideas being explored here but you never veer too far away from their signature sound. I find this album to be a graceful exit for Plone and I hope you enjoy it as much as I do. The album is 17 tracks. I think track 10, "One Song," is the one missing from the version you commonly see.